Many puzzle games – particularly on mobile devices – can be argued as being insultingly easy or too mind-numbingly obtuse to even be comprehended by human minds. Luckily *Tetrobot & Co. doesn’t fit into either of these categories. The story of this game revolves around an intelligent young lady who spends her time fixing the many broken miniature robots that her ‘clients’ send her, though there are twists as the plot progresses. You start off with your own robot, Tetrobot, who is suffering from some severe malfunctions, but due to the awkwardly tiny size of your friend you have to send in a new machine directly into it in order to cure what ails it. This is where the gameplay kicks in, as you control this microscopic robot known as Psychobot in your attempts to repair the malfunctioning robots that are presented to you. The game plays a lot like a point-and-click adventure, but of course with an all-encompassing focus on solving puzzles. You have to navigate the worlds by clicking on the square that you want to move to, and there are numerous ways of doing this that the developer has seen fit to include. You can use the GamePad to simply tap the place you want to go much like a touch screen mobile game, you can use the Wii Remote to point and click in a similar way, or you can use a Wii U Pro Controller to move the cursor with the control stick. The last option sounds awkward and unintuitive, but this reviewer actually found it to be the most relaxing and comfortable, as it takes advantage of the big screen but doesn’t require an outstretched arm. The game’s presentation is incredibly charming; the music is chipper and light-hearted, the bots are all cute and friendly, even the parts where you have to murder innocent slime monsters comes across as whimsical and harmless. Each bot has its own theme, and these really help to distinguish the levels on a visual basis. Every time you place a block down you’ll be rewarded with an appropriate clonk or ping depending on its material, and the blocks themselves are easily distinguishable from one another, so you’ll never be confused by a block’s appearance. The gameplay revolves around blocks of various materials such as wood, steel, sand, and slime to name a few. You have to pick these up and store them for later use, and every time you encounter a new one an entry will be added into a menu called ‘faceblox’, a Facebook-inspired encyclopaedia of the various elements and blocks you’ll find in the game, with a lightly cryptic description of what exactly they do. You then have to use your clever brain coupled with the in-game physics in order to solve the puzzles laid before you and progress to the next level. That’s not your only objective, though — as you mill around the first level you’ll discover fragments of a golden Memory Bar that you can choose to ignore or attempt to retrieve for some bonus in game content, as well as the satisfaction that comes with getting the word ‘perfect’ stamped onto the screen. The content you unlock consists of information about the bot you’re currently repairing, and naturally the more you collect the more you’ll unlock. Don’t ignore these memory blocks completely though, as they’re necessary for unlocking future levels. The game is fairly generous with this, though, and if you can’t quite work out how to get a Memory Block you can simply bypass it and still be able to progress. You may have to do some backtracking, however, so it’s good to grab them as soon as you see them. The gameplay is a clever balance between accessible and challenging. Simply getting to the exit is often not too much of a brain-teaser, but if you want to collect all three Memory Blocks and complete the Memory Bar for that level you’re going to have to really pay attention. The game isn't cruel, though, and as difficult as the puzzles can be, as soon as it’s been solved it all becomes so very clear and simple, and this reviewer found himself on several occasions slapping his face into his palm at the solution to some of the puzzles. Nothing is too obtuse, and the game quite gently introduces you into new mechanics and ideas. The learning curve is a bit wobbly at times, but it’s never enough to completely stump you unless you’ve not been paying attention. On occasion you may be held up longer than is necessary, but this is usually down to the player and not necessarily the game. As the game progresses, getting the Memory Blocks becomes more and more of a task, and you’ll have to begin thinking about the levels as a whole rather than just individual rooms. 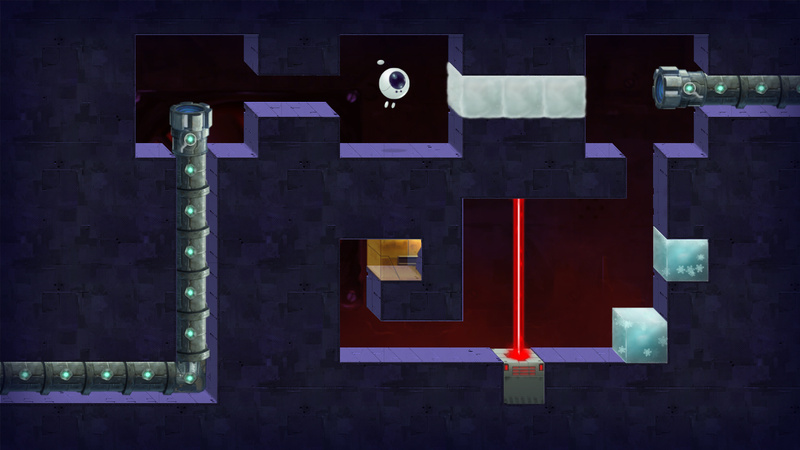 For example, you may find a block later on in a level that allows you to re-solve a previous puzzle at the cost of fewer (or sometimes even no) blocks, allowing you to take them into other rooms later on and using them to your advantage. The puzzles can often be treacherous, but they never feel unfair or misleading. After you’ve repaired a number of tiny robots, you’ll see something considerably less appealing on the main menu; a large gelatinous blob called Big Mama. This is the game’s first boss, and it’s interesting to see how she puts an extra spin on the gameplay. Although it’s really not very different to playing a normal level, there are no Memory Blocks to collect and the challenge is much greater than your basic main level. You have to collect blocks and launch them at Big Mama, and although she doesn’t pose a threat to you directly, you need to hit her three times in order to stop her stationary rampage. The blocks you’ll need to hit her with are well-guarded as well, and you’ll need to solve some truly mind-bending puzzles in order to get to them. There are also some other levels that are more difficult than normal, and you unlock them by obtaining every Memory Block in a particular bot’s series of levels. 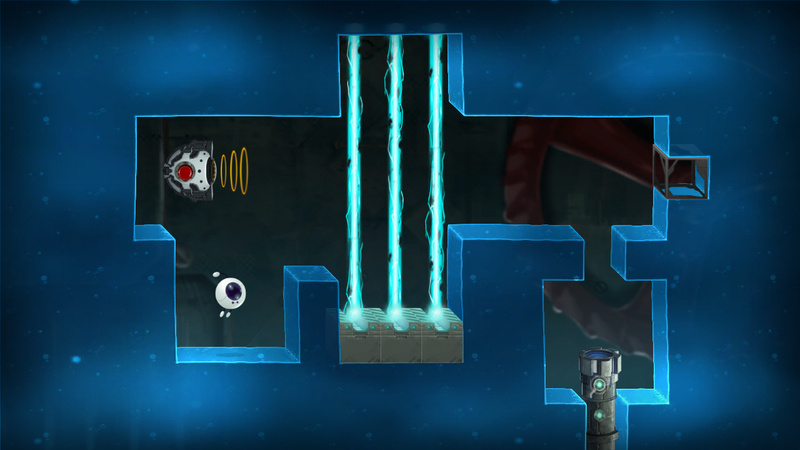 Each bot has their own sixth level to unlock, and once again you’re faced with a more difficult challenge than usual and no Memory Blocks to collect. These are not quite as difficult as Big Mama, but will still require a great deal of thinking to solve. In these levels there’s a golden key to collect, but we won’t spoil what their purpose is in this review, you’ll just have to play the game for yourself to find out. 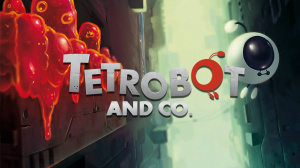 Tetrobot and Co. is a beautiful, charming puzzle game with a very fair and calculated approach to difficulty. You’re not going to waltz through this 10+ hour title without breaking a mental sweat, but you’re also not going to be left so frustrated and confused that you don’t want to pick it up again; a puzzle that may seem incomprehensible to you may be a walk in the park for someone else, and vice versa. You may be held up by some puzzles, but it's not due to a fault in the game. Tetrobot and Co. really tests every facet of your mental agility whilst still providing an incredibly enjoyable and (sometimes) relaxing experience. 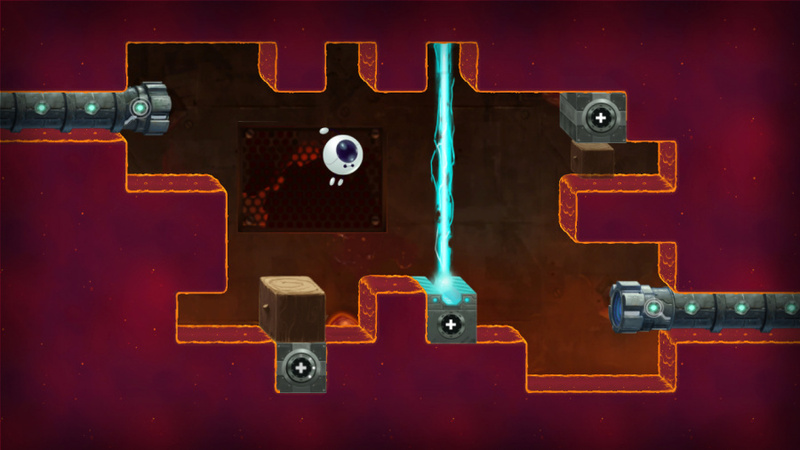 It’s a gem of an indie titles on the Wii U eShop, and any puzzle fan would be mad to miss out. I second the score. Played it on Steam, one of the best puzzle games I've played in recent years. I was considering it, but the overall style isn't my taste. Still, good to hear it's a quality title! Never heard of this one, thanks for the review. I bought this game together with Stealth Inc 2* (which was the main reason I visited the store) and was genuinely surprised by how good this game is. I expected a decent puzzler, but it really impressed me with its clever puzzles -especially when you try to get all the memory blocks in a level-, excellent touch controls, and the way in which it introduces new mechanics without telling you anything. Observe, learn and apply. Moreover, like with all great puzzlers I had my fair share of aha-erlebnisse/epiphanies while playing it. Solutions don't always come easy, and it already managed to make me think pretty hard during some of its first levels, which makes it a rewarding experience. And because of the good controls, rewind function and quick movement, it's all about the puzzles and not about slogging through the levels and performing arduous tasks that test your patience. I've by no means finished it yet (about halfway through), but I've seen enough to recommend this heartily to puzzle lovers. Hmm...this game sounds really good seeing as I like puzzle games and could always more games for my Wii U! Same, I'd like a demo to have an idea how it feels/plays. Cool, I'll have to give this a go. Lots of quality stuff in the eShop is good to see! This sounds like the rare puzzle game that I'd actually enjoy. I'll keep it in mind. I just bought this and played through the first world. I'm loving it. 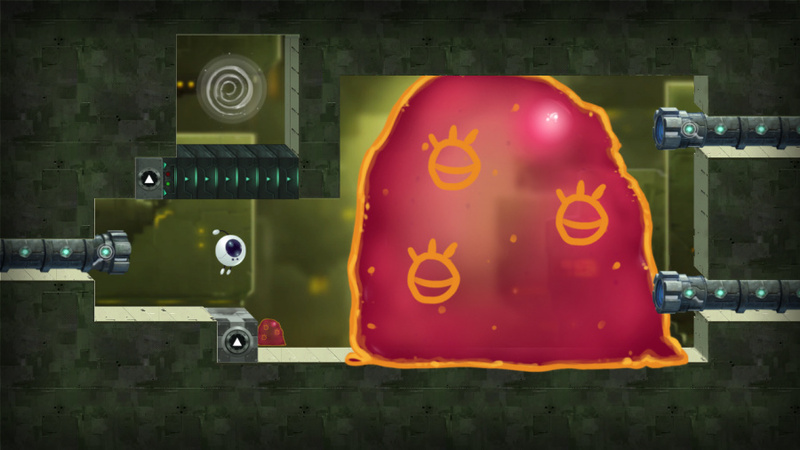 It taps into the simple but satisfying vibe of the Toki Tori remake back on WiiWare. And the control works awesome with the Wiimote since it seems it was designed around a mouse and a left click. And its polish is on the high end by eshop standards. On sale for $3 instead of $10 right now. Probably worht a look people looking for agmes on the cheap, 8/10 great recommendation. @XCWarrior I ignored it the first time, but gave it a chance now that it's on sale. Great game!